I took a little break from blogging this past week. But it’s been an eventful week worthy of a couple of different blog posts. Last week the calendar announced “First Day of Spring”. That first day of spring wasn’t very spring like here at all but towards the end of week we did have some gorgeous spring like days full of sunshine. But this post isn’t about spring. As a mother I entered into a new chapter or season of motherhood: all of my children are teenagers. At least chronologically. I have been a mother for nearly 17 years and I gave birth to my last baby 13 years ago. On the first day of spring, my “baby” girl celebrated the anniversary of her birth. She became an “official” teenager. Her age now ends with the word teen. She’s thirteen. I look at her and though I can see the beautiful, thoughtful, kind and caring young woman she is becoming, I still see my little girl. The baby who demanded to nurse every 2 hours, the daring toddler who had to explore the whole world. The preschooler whose motto was a stranger is just a friend whose name I haven’t learned. She jumps into things with both feet and drives me utterly insane by not doing things in a more logical sane matter but oh grateful I am that she is my daughter. I can not imagine life without her. So I begin a new season of motherhood: a season where all my girls are teens. Happy Birthday, Tailorbear. I love you very much. I’ve been silent for over a week on my blog. It’s not that I haven’t had anything to say. (If you know me “in real life” you know I always have something to say <grin>) Nor has it been overly busy here. Oh we’ve been busy but not so busy that I couldn’t take a few minutes and write a blog post. No, we had some pretty big stuff happening here and I’ve been trying to process. I don’t usually post twice in a day especially when I’ve been, to use a theater term, dark for so long but look for another post later today about the new season in my life. So now on to the topic at hand. I really am enjoying the Blogging Through the Alphabet meme that Marcy is hosting over at her blog Ben & Me. Today is the end of the E week. I’ve been struggling to find something that begins with the letter E. Elephants? Everything? Expectations? Wait. I haven’t blogged about Bountiful Baskets or shared some of my photos of the great edible fruits and veggies. E is for Edible? Um.. Edible fruits? As opposed to what wax fruits? Nope that doesn’t work for me. We love eating the variety of fruits and veggies. We love eating asparagus roasted. I discovered that the only way to eat brussel sprouts is to roast them. With lots of garlic! Turtlegirl especially enjoys eating apples right out of the fridge (after washing them of course). Honeybear doesn’t especially enjoy eating soup but he’s been eating soup I make with things like celery, potatoes and cauliflower. What do you especially enjoy eating? Have an E topic you want to share? Come join in at the Blogging Through The Alphabet meme. I prefer a literature based approach to learning. That means we read a lot of books here at Aletheia Academy. But I don’t just want the girls to read great books. I want them to learn from great books. Progeny Press Study Guides for Literature offer the opportunity to go deeper with a great novel. We received two study guides in the PDF format. Customers can choose PDF format and receive an email with the PDF attachment. Others forms include CD and Booklet. As a convenience, Progeny Press also carries the novels for the study guides. The TOS Crew could choose between several study guides as well as between Middle School, High School or one of each. I choose to do one Middle School study guide (The Bronze Bow $16.99) and one High School study guide (The Screwtape Letters, $18.99). I assigned The Bronze Bow Study Guide to Tailorbear, my 7th grader. She is studying World History this year and read this book as part of her required reading for school. She had completed reading the book before starting the study guide. She says she would rather “ look at the study guide and read the chapters that it says for each section then do the questions. It was really difficult for me to remember things like what Daniel was doing in chapter 8.” She liked working independently and I loved how this product engaged her. I never had to fuss at her to work on her assignments in the interactive study guide. I did wish that I was more involved and when I asked her she replied "If Mom was reading the book with me and sharing her thoughts that would be cool, but I like being independent." You can view a sample of The Bronze Bow Study Guide here. Both Boobear (11th grade) and Turtlegirl (9th) grade are working through the study for The Screwtape Letters. Turtlegirl had so much to say about this product that she wrote her own review. Please click on the link to read her details about this study guide. Boobear read the book according to the sections she needed. She would take a day or two to read those “letters” and then worked through the questions for that section at about a page a day. The study guide suggests a pace of about a section per week. Thoughts from BooBear:"I really enjoyed the questions. They made me think about the book in a proactive way not just a passive way. I liked the vocabulary questions. They are similar to what would be on the SAT. I don't like that they have 5 or 6 questions inside one so-called question." You can view a sample of The Screwtape Letters Study Guide here. Both study guides suggest working through approximately one section per week. Most guides will take 8-10 weeks to complete. All three girls found this to be a good pace. My Thoughts: I found the Middle School guide very appropriate for my 7th grader student. If I were to use this study guide with either my 9th or my 11th graders I would have to add writing assignments to bring it up to a high school level. I found the level of work in the high school level appropriate for my high school students. The content of the book The Screwtape Letters is too mature for my 7th grader, however, put that aside, I would have to reduce the writing assignments so as to not overwhelm my younger daughter. I would think this applies to all high school level guides, if the content is appropriate for your student, you may have to reduce the expectations and the writing assignments. That said I think I would stick to using the age guidelines given for each study guide. With over 100 titles to choose from, I’m sure Progeny Press has something to offer everyone. There are a variety of genres and guides for every level from K through High School. I see lots of titles that interest me such as Frog and Toad are Friends, a K-2 level study guide that looks fun for Supergirl. Click on the banner below to read what my fellow crew mates had to say about the different Progeny Press Literature Guides. All information is correct and accurate as of the date of this review. Disclaimer: As a TOS Crew member, I received two literature guides free of charge to review. This review is my honest opinion with, hopefully, enough detail as to why I liked or did not like a product so that my readers can make an informed decision. I received no compensation. As I sat down to write my review for Progeny Press I began to question the girls. I needed to get a better feel for the study guides. They used them. I just looked them over. Turtlegirl suggested that she write the review. So this is her guest review. Turtlegirl’s Review of Progeny Press study Guide for the Screwtape Letters by C.S. Lewis. My mom was given the opportunity to review The Screwtape Letters study guide from Progeny Press. C.S. Lewis’s epistolary novel is well known for its spiritual and cultural legacy. Since I was already supposed to read the book and answer questions about the book for school, my mom and I decided it would be good for me (and BooBear) to shoot for this review product. The Study Guide was designed for the person to read the book and then complete the guide. However, I just read what I needed to read for each section or two and then completed the section(s) for those letters. I enjoyed the vocabulary sections because each one was different. Plus, I have always loved vocabulary. The Analysis and Digging Deeper questions often required a Bible, and as I am not good at navigating a Bible that was a little difficult. A lot of times it felt like they were using the Screwtape Letters to springboard self-examination. I’m not sure if I like that. But I do enjoy the general ‘questions’ section because that is more reading comprehension. It usually includes questions like: What event prompts Wormwood to become ‘delirious with joy’? Those are the kind of questions I enjoy answering. For me, the Study Guide was fun, and I was glad that for the most part the questions were open-ended. I don’t like being put in a box. So I was happy that I wasn’t put in a box. The questions were also thought-provoking. That was nice because usually I like thinking. Review by Turtlegirl, Age 14 Grade 9. Please note that I (Tess) received this study guide for free through TOS Homeschool Crew for review purposes. This review is my daughter’s honest opinion. Click on the link to read my review: TOS Review: Progeny Press Study Guides. A, B, D…. Did you notice I skipped C? Yup. I missed last week’s Blogging Through the Alphabet and that was the letter C. So I’m going to sneak in a quick little C blurb. You won’t tell on me, right? C is for Cell Phone. Cell Phones have been around for years and years. My first cell phone was a shared phone and was really more of my husband’s phone It was 1998 and we decided it would be good to have so that we could get in touch with Daddy very easily. We have had one or two cell phones ever since. We’re not really cell phone people. We have the phones mostly for convenience and emergency. I could almost live without my phone and most days I do. But since there are times I do need a phone, I was rather bummed when my daughter informed my husband that my cell phone was now cleaner than any phone should be. And dry too. Yup, it went through the washer and then through the dryer. Honeybear and I set off to the store to replace my phone. We came with an upgrade for me, an upgrade for him and somehow or another we ended up with a third phone! Yes, we decided it was time that our oldest daughter have a cell phone. She would borrow mine when she’d go babysitting or to youth group activities but now she can have her own. So speaking of daughters, that brings me to the letter d and the real subject of this post <grin>. I’m rather embarrassed to confess that I couldn’t think of a D topic so I asked my girls. I said “girls. I need a topic for the letter D.” One replied “dinner.” Another replied “daughters. You have enough of them.” <hangs head> why didn’t I think of daughters? My musical BooBear. She sings in the choir at church and delights us here at home with her piano playing. Technically my second born, Supergirl who wants to be just like her sisters and on the day of this picture that meant playing outside in the snow! Turtlegirl always has her nose in a book. She’s always been my bookworm! Tailorbear isn’t afraid to get her hands dirty and loves to help in the kitchen. I’m grateful that she doesn’t mind getting her hands dirty! This post is linked up to Marcy’s blog Ben & Me as part of the Blogging through the Alphabet meme. Come and join us this week as we blog through the letter D.
Last year, as part of the TOS Crew, I had the opportunity to review Song School Latin from Classical Academic Press. We loved the introductory Latin program so I was really excited to see CAP on the upcoming Vendor list for this Crew year. I was even more excited when I found out it was for the logic program The Art of Argument. Though targeted for junior high students, this course is appropriate for high school students who have not previously studied logic. I would go so far as to say it is appropriate for adults as well. Though I often recognize when someone is using a logical fallacy, I cannot always identify the fallacy. I am learning right along with my 3 students (7th grade, 9th grade and 11th grade). I appreciated receiving both the student text and the teacher’s edition. At first I was not sure if having the teacher edition was really necessary but I have decided that I love having it. Along with having the exact student text with answers, the Teacher edition also has chapter quizzes and tests that I can use. Permission is granted to photocopy those for classroom use. Because I have three students using this program, we are doing more of an oral/discussion approach. Instead of writing out answers, we take turn answering questions and this leads to more discussion. If your students like to write out their answers, you may want to purchase a student book for each participating student. Along with the Student Text and the Teacher Edition, we received disk 1 of the DVD set to sample. Disk one includes an introduction and the first 6 fallacies. We choose to watch the fallacy discussions after we had our own discussions. All of us concur that the DVD would be very helpful for families where only one student is taking the course but the DVD is not necessary in situations like ours where we have 3 students plus mom working through the course. We are able to have our own lively discussions. Classical Academic Press has two other Logic programs as well. We had a small mix up and were sent The Argument Builder by mistake. When we received our copy of The Art of Argument, I received a lovely apology letter. CAP is graciously allowing me to keep The Argument Builder. The letter alone, in my opinion, demonstrates good customer service. Being allowed to keep the wrong material? That goes above and beyond basic customer service. Thank you CAP! When BooBear has finished working through The Art of Argument, she’ll be able to tackle the more mature material of The Argument Builder. Perhaps next year Turtlegirl can use it and in a few more years Tailorbear should be ready to handle the writing requirements. The Art of Argument student book retails for $21.95, the teacher’s edition retails for $24.95. The DVD set is available for $54.95. There is a bundle package available for $88.95. Update: You may also be interested in my review of Discovery of Deduction. Visit the Schoolhouse Review Crew blog to read what others have to say about The Art of Argument. I enjoyed John Ratzenberger years ago on Cheers and more recently my family has loved his voice work in the Disney Pixar movies, so I was excited to see his name as the Woodcarver is this new DVD from Faith &Family Films available from Christian Cinema. I have a nearly 13 year old daughter who is going through the “contrary stage”. You know the stage where she says she doesn’t like something just because you do or she doesn’t want to watch a movie just because you do? She told me that she didn’t think she would like the movie. She was afraid it would be “too sappy and over the top Christian”. She didn’t want to watch it. Towards the end of the movie my daughter remarked, “What is it with me not wanting to watch these movies and ending up liking them?” I think that says a lot. She was riveted to the screen. I wonder if she identified with the troubled teen? I wonder if she just recognized the voice of Ernest Otto? In any case this was a movie that my whole family enjoyed and one that we will be watching again. The characters were believable and John Ratzenberger did an excellent job portraying the struggle between faith and loss. He was a widower who had strong faith but when his wife died, he felt as though God had ignored his prayers. He finds his balance again in mentoring a boy and both are restored to a stronger relationship with God. You can watch a trailer of the movie by visiting the Woodcarver page at Christian Cinema. The link for the DVD is on the left hand side directly under the cover image. I think this is an excellent movie to add to a family collection for a family movie night and I am thrilled to be able to host a giveaway. One of my blog readers will have the opportunity to add this DVD to his/her family’s collection. The first thought that went through my head was Schlessinger Media. I discovered educational DVD’s produced by Schlessinger media at my local library. I am sure that if you searched the web you could find the website and maybe even order some great DVD’s but I love just checking them out for free from my library. I use these videos as supplements. I especially love the All About Series for grades K-4. My girls loved them. When the girls were younger, I would search the library for DVD’s to match the topics in the science curriculum. My second thought for my favorite resource is even broader: the library. My library has “theme packs” and I would sit on the floor and flip through them looking for specific science related topics. I still browse the non-fiction shelves for books for Supergirl. The library is a rich resource for materials to supplement science. It is the first place I go to to find books that we need to deeper explore a topic. It is the first place I check when I want to get science related DVD’s. Now I feel the need to schedule a trip to my local library to see what new science dvd’s and science books I can find. “What’s your favorite science resource?” will go live March 13th. 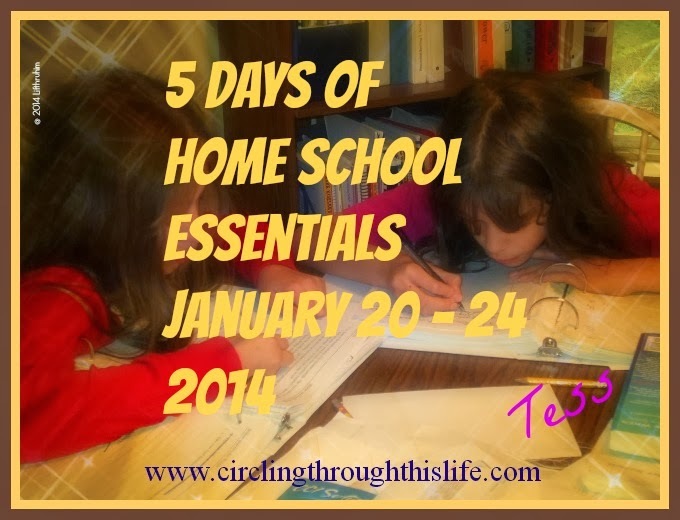 In the meantime you can check out past Blog Cruise topics at the TOS Homeschool Crew Blog. Tailorbear (age 12, 7th grade) and I are polar opposites when it comes to teaching and learning. She wants to jump in with both feet and explore her own interests. I want everything laid out nice and neat with structure and plans and an answer key. While looking over the Creek Edge Press website, I knew I had to express interest in reviewing this for the crew. Not because it fits my style. It doesn’t. It doesn’t appeal to me. It’s too open ended. It’s not structured enough for my taste. But I knew it would appeal to Tailorbear. I hoped it would meet her “I can do it myself and let me just jump in with both feet” style. This particular course is labeled for grades K-8 and the accompanying booklet gives guidelines for using the task cards with younger children as well as suggestions for older, more independent students. Because I need more structure, I would be intimidated using these cards with Supergirl (developmentally delayed, doing 1st grade work.) It would require more time and teacher preparation than I am able to do. However, for older students who can work independently and who are highly motivated by the subject matter, the cards could work well. The Chemistry Task Card set retails for $18 (US) It includes 30 task cards and a Course Introduction Booklet. The Course Introduction includes “instructions for using the cards, step by step instructions for preparing the learning environment, and a guide for selecting books and materials to use throughout the course.” To see samples of Task Cards please visit the Gallery. You can check out the scope and sequence and a suggested book list by visiting the At Creek’s Edge tab of the Creek Edge Press Website. My Thoughts: I liked how independent Tailorbear could be with these cards. I think the Chemistry Task card projects met her need for hands on learning. I loved how excited she got over the idea of making a model of an atom. She was completely self directed and even searched for her own materials. Tailorbear impressed me by creating her own assignment notebook so that she could “better organize her week.” These cards were more successful in my homeschool than I thought they would be. For an older child who is looking for an independent study course, I think Creek Edge Press would be an excellent choice. In addition to Chemistry, there are several other science sets. In addition to science there are also history, geography and culture cards, art cards, and music card sets. My oldest daughter (age 16, 11th grade) is intrigued by the task card approach and has asked for the Task Card set for Music. Click on the banner below to read what my fellow crew mates had to say about Creek Edge Press. All information is correct and accurate as of the date of this review. It’s early for me. It’s only 6:30 am. I’ve been up for half an hour now. The house is quiet. Somewhere down the hall my husband is getting ready for work. I hear the heat kick on and I hear the air being forced out. The girls are still sleeping. I have a to do list a mile and a half long but I’m not sure where to start. It’s Wednesday and I’m looking forward to going to Liturgy tonight. There’s things to do to prepare for church (Such as make sure we all have clean clothes and get the soup prepared ahead of time so it can stay warm in the crock pot until we get home.). And I have things like look over review products to figure out a plan to use them. (Just got THREE new homeschool products to review for the Crew.) And I’ve got some reviews coming up (look for Creek Edge Press in the next day or two), so I have some research and writing to do for those reviews. Here is hours later. The sun is shining brightly. I’ve washed two loads of laundry (one load of towels and one load of darks). Tailorbear made bagels for breakfast. But something is missing. Something still nags at me. It tugs at my heart. I ignore it. Finished with Art of Argument and confronted with the antics of a disagreeable little girl, my heart can take it no longer. PRAY. My heart cries out “you forgot to pray.” I realize that what I crave; what I need is some time with the Lord. It is Lent and I told myself I would spend more time in prayer. Almighty God, our Help and Refuge, Fountain of of wisdom and Tower of strength, who knowest that I can do nothing without Thy guidance and help; assist me, I pray Thee, and direct me to divine wisdom and power, that I might accomplish this task, and whatever I may undertake to do, faithfully and diligently, according to Thy will, so that it may be profitable to myself and others, and to the glory of Thy Holy Name. For Thine is the Kingdom, and the Power, and the Glory, of the Father and of the Son and of the Holy Spirit: Now and ever and unto ages of ages amen. My heart longed to be filled and now that I’ve met that longing, my stomach longs to be filled. When I was growing up Lent was a time to be endured. I confess it had little meaning for me and I strongly disliked it. I remember one year crying about Ash Wednesday. I didn’t want to go to church. I didn’t want ashes on my forehead and I certainly didn’t want to start eating fish on Fridays. I like my meat thankyouverymuch. I don’t particularly care for my mother’s tuna noodle casserole (with potato chips on top) nor was a big fan of cheese pizza (pizza? Yes. With pepperoni preferably). I didn’t understand why I couldn’t eat what I wanted. All I understood about Lent was that I couldn’t eat meat on Fridays. Lent had no meaning for me. My focus was only on how I could live through fish sticks and fish sandwiches at school for lunch on Fridays. And I discovered Orthodoxy. Orthodox fasting rules make Catholic Lent seem like child’s play. No meat, no fish, no dairy, no eggs, no (olive) oil and no wine. (Is there anything left?) I often joke that I should have returned to Rome at least then I could beef broth with vegetables even if I couldn’t actually have the beef. But food stuff aside, Lent has become so much more to me. It’s not about the fasting. (Yes that is a BIG part of Lent). It’s about evaluating myself. It’s about teaching myself discipline. It’s about reflecting on how far I have fallen and how I can repent and return to God. I find myself wanting more time for prayer. I find myself doing self-examination and I am repulsed by what I see in my heart. I find myself needing to be at church more. I need more of God. Lent is the season where I fall in love all over again with my Savior as I reflect on how desperately I need Him and I am awed by how much He loves me. This post is linked up to 40 Days of Seeking Him hosted by Trish at A House upon the Rock and Laura at Day by Day in our World. I had originally planned to write my Blogging through the alphabet letter B post on Books. I like books. I have lots of books. I was even going to post pictures of bookcases. But I spent the late morning/early afternoon at urgent care getting x-rays of my foot to make sure that when I smashed my toes, I didn’t actually break the bones. I have no idea exactly how it happened. I mean I know what happened. I know how my foot (my toes specifically) got hut but I don’t know the WHY of the how. I mean how does one NOT know where one’s foot is? How does one get so distracted that when one is pulling the chair forward, she puts it down (with full force and full weight in the chair) ON the foot. How? How did I do that? I guess I just wasn’t paying enough attention to what I was doing. One of the girls was talking at me. I was trying to get my breakfast and I had some computer work I was doing. We don’t have the official report from the radiologist but it does look like I only managed to damage the soft tissue of three toes at the base of the toe. No visible breaks, cracks or fractures in the bones. I’ve been told that it could take weeks to heal and I am to take it easy for the next couple of days. Ibuprofen is my friend. The ice pack is my friend. I am very glad that I am writing a post that says that B is (NOT) for Broken Bones instead of telling ya’ll that I broke bones. Join Marcy at Ben & Me and Blog through the Alphabet! This week Marcy says B is for Boy! Some friends of mine are hosting a “blogging through Lent” event. I want to participate in 40 Days of Seeking Him but I won’t be blogging about Lent every day. I started, though with my post about Forgiveness Sunday. Today I want to focus on a prayer that I need to spend more time with, that I need to be meditating and praying more. During Great Lent, Orthodox Christians spend more time attending services. One of the most beautiful services is the Presanctified Liturgy which is served on Wednesday and Friday evenings. Yea, O Lord and King! Grant me to see my own transgressions and not to judge my brother, for blessed art Thou, unto ages of ages. I’ll be linking this post up to Trish’s blog A House Upon the Rock but just so ya’ll know Laura over at Day by Day in our World is also hosting 40 Days of Seeking Him.